Are you looking for questions to match popular poems associated with Lord of the Flies? 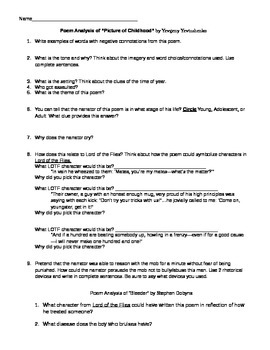 In this document, there are 4 poem question pages. The poem is not included, but can be found elsewhere. Every poem has questions that deal with the poem analysis, connections to Lord of the Flies, and a review of rhetorical devices. Also, a poem assignment is included. Students will write a poem that connects to a scene or character from Lord of the Flies and write a reflection connecting their poem to the novel. A rubric is included. I am using this in my 10th grade advanced and regular English classes.